Storm windows have become popular among homeowners in South Florida thanks to the wild hurricanes visiting our area every so often. Due to this popularity, storm window producers have worked hard to develop their products. 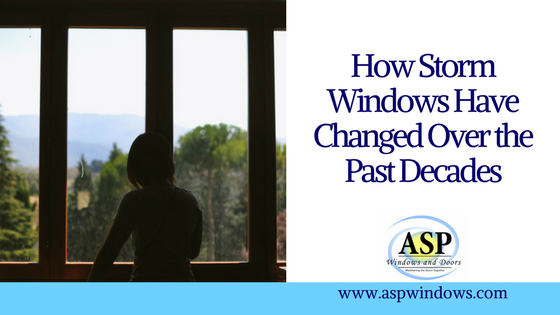 The result is that storm windows immensely improved over the several last decades, with most of the trends coming straight from South Florida. We’re experts when it comes to dealing with nasty hurricanes and developing innovative ways to protect our homes. Hurricanes are natural calamities that claim lives and devastate homes and property. After a strong hurricane, people are often left with the debris of what was once their home and community. In 2008, Hurricane Ike claimed 74 lives. It went down in Texas’ history as one of the most destructive and costly hurricanes ever. It totaled $34.8 billion worth of damages. Hurricane Andrew devastated South Florida in 1992. This Category 5 hurricane resulted in $47.8 billion in damages. Hurricane Sandy was a category 1 hurricane that swept New Jersey and New York in 2012. Destroying 650,000 homes, it left damages amounting to $70.2 billion. Before its landfall on Louisiana, authorities already saw that Hurricane Katrina was an entirely new beast. It was a category 5 monster storm that left $108 billion worth of damages. In 2017, Hurricane Harvey had a landfall at Port Aransas, Texas. Its winds were so strong, it left the area damages amounting to $180 billion. While all of these hurricanes were disastrous, we’re going to explore Andrew in a bit more detail. After all, we are in South Florida. Hurricane Andrew was a Category 5 storm that made a huge mess in South Florida. It flattened houses and buildings, and people could not do anything about it. Andrew did, however, spark a whole new way of thinking about how to prepare for disaster. That hurricane changed the way South Florida mitigates and prepares for other possible hurricanes. We became an international leader when it comes to storm preparation. After ‘92, South Florida approved a building code to make sure all buildings are structured to withstand strong winds. After July 2001, all homes are required to have storm windows or impact windows on their exterior openings. With all the devastating storms to hit South Florida after Andrew, glass companies have made sure they attend to the people’s safety. Nowadays, doors and windows carrying all different levels of protection and strength are available. Consumers can choose thicker glass, a thicker interlayer, or have them both. Polycarbonate can also be used as a reinforcement material. South Florida is not a rookie when it comes to facing devastating storms. Today, though, we face these storms prepared. That’s where impact windows and impact doors become so valuable. Get them installed in your home today! If you live in Miami and South Florida, contact ASP Windows and Doors. We offer impact glass installation to protect your home and business units. Call us today at (844) 311-7767.